Garage Door Openers Archives | Markham Garage Doors Ltd.
To the casual observer, it may at first be testing to find any similarity between automatic garage door opener and major household utilities like hydro, water, and gas. Let’s face it; the former is a mechanical device while the latter are fundamental services that help make a home inhabitable. Upon closer inspection though, there are some similarities when comparing garage door openers with public utility services, principally with respect to convenience and reliability. At basically the flip of a switch or the push of a button, one can open/close their garage door just as easily as they can turn on a television or pour a glass of water – that is the convenience factor. From a dependability perspective, the garage door opener responds each time and every time, in the same way, that the lights always come on and the bath always has hot water. This is why it is bewildering when any of the above comforts fails to respond; a failure is so unforeseen, it leaves a homeowner and their family members essentially in disbelief, not to mention that it is often highly disruptive to their daily routines. And in the case of a garage door opener, Murphy’s Law dictates that it will stop functioning at the absolute worst possible time to have a car trapped in the garage. If the above actions are unsuccessful in isolating the issue and/or restoring the operation of the garage door opener, it would be prudent for homeowners to call the garage door service professionals at Markham Garage Doors to determine the best course of action. In some instances, depending on the type/extent of the repair work needed, it could be more cost-effective for homeowners to move forward with the installation of a new and upgraded garage door opener; when a full replacement is a better/preferred option, it is advisable to consider the LiftMaster line of garage door openers. LiftMaster has been a leading manufacturer in the garage door opener industry for more than 45 years, developing and distributing a brand that well-known and respected for its quality, innovation, and emphasis on safety. LiftMaster garage door openers can only be obtained from manufacturer-approved distributors such as Markham Garage Doors, who in turn have trained technicians on staff to ensure that the installation process is done in an expert and appropriate manner to guarantee optimal performance and safe operation. If you require garage door opener repair service or the installation of a new garage door opener, call Markham Garage Doors today at (905) 472-9178 or (416) 570-3667 to schedule an on-site visit and/or to obtain more information on the LiftMaster series of products. When asked, any homeowner with a garage door opener will quite likely certify that such a device offers several benefits to their family. It would not take long, perhaps within a day after the installation, for that homeowner to wonder aloud about why they waited so long to take advantage of the conveniences that they now enjoy with respect to entering and exiting their garage. Additionally, the garage door opener can provide a number of security measures for both the family and their personal possessions, and although there are high hopes that there will never be any type of unwanted intrusion through the garage, the peace of mind from such protection can be quite tangible. When the convenience and security of a garage door opener are added to its durability/reliability, there are valid reasons to believe that the homeowner has made a wise investment for the next 10 to 15 years; this lifespan is based on an average of 1,000 to 1,500 opening-and-closing cycles per year. Despite this dependability, however, there can be times when the convenience and the security of a garage door opener can be at odds; one such case occurs when the garage door opener is getting power (its light comes on) but the door itself does not open when commanded. While this may be great for security, it can be particularly inconvenient for the person who wants/needs to enter or exit the garage. Disconnect switch – has the rope or knob been unhooked accidentally? Garage door lock – (common with older doors) has it been engaged? Tracking – is any door movement being hindered an object/obstacle? Opener – is there an issue with the capacitor, motor, or drive system? Garage door spring – it is broken, or has it lost some/all of its tension? Some of the above assessments can certainly be completed in do-it-yourself fashion, and if they identify the cause of the problem, the respective remedies can also be done by the homeowner. However, in the event that an issue is unidentifiable, more complex, or directly related to the garage door spring, it would be prudent to turn to the expertise of a professional garage door services provider such as Markham Garage Doors. 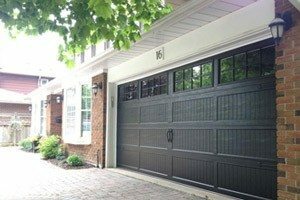 The technicians from Markham Garage Doors have considerable experience with both the installation and repair of garage door openers and can apply that familiarity to determine the source of the problem and perform the necessary repairs or perhaps recommend the installation of a replacement opener. Markham Garage Doors installs and services all common models of garage door openers and has the expertise needed to quickly and accurately identify an issue and recommend the best course of action. For further insight on the garage door opener services from Markham Garage Doors, see our Garage door won’t open or Garage door won’t close page. If there is a problem with your current garage door opener and you cannot identify the root cause, call the experts from Markham Garage Doors today at (905) 472-9178 or (416) 570-3667 to schedule a service visit as soon as possible. There is little doubt that a garage door opener has become a modern convenience for many homeowners, allowing them to drive into and out of their garage without the need to exit the vehicle to lift or lower the door. This is certainly a handy amenity in times of inclement weather as well as a safety feature when arriving home after dark. In most cases, these homeowners simply push a button on a remote control device then wait for the door to open or close without giving this action a second thought. So it may be surprising to many people when they learn that a garage door opener actually does very little in terms of moving the door up and down. Yes, the door opener does provide a small amount of force to control how far the door travels when activated automatically, but it is the tension stored in the garage door springs that really does most of the heavy lifting and lowering. In addition to its ‘prompting’ of the springs, a garage door opener can act as a lock when a door is in the closed position. When garage doors openers were first introduced and began growing in popularity, users encountered issues in terms of security or, more accurately, a lack of security with their remote controls. Initially, this resulted from the limited number of frequencies that were being shared between transmitters (remotes) and receivers (door openers); when this situation was rectified through the introduction of multi-code systems, security was quite basic and thieves were able to ‘crack’ these codes rather easily. A garage door is frequently and repetitively in motion, usually performing two or more open-and-close cycles each and every day. Therefore, a properly installed garage door opener can indeed be a valuable asset to any homeowner, from the standpoints of both personal convenience and improved home security. Based on the number of times that an automatic opener will be commanded to open and close a garage door, the device and its accessories will need to be reliable and durable. In addition to the quality of the actual unit/motor, a critical factor in ensuring consistent and long-term performance will be the standard of garage door opener installation. The trained technicians at Markham Garage Doors are manufacturer certified to install LiftMaster, one of the leading brands worldwide for over 45 years. The LiftMaster product line is well recognized for its combination of performance with the ultimate in safety and security features. This series is not available through commercial means but rather is distributed via licensed dealers such as Markham Garage Doors. Looking to install a new or replacement garage door opener? Call the garage door opener installation professionals at Markham Garage Doors today at either (905) 472-9178 or (416) 570-3667 to discuss the ideal solution for your specific needs. Many homeowners with a single car garage may often be heard bemoaning the fact that they should have purchased a home with a double car garage in order to give them more storage space. This restricted space can become particularly frustrating if they choose to park a vehicle in the garage, as they may have to move it out to the driveway every time they want to access the lawnmower, snowblower, gardening equipment, or their children’s bicycles. What is interesting in such a scenario is that homeowners with double car garages have the same lament. They still do not seem to have enough space for everything that they want to store in their garage regardless of where they park their vehicles. And to further complicate matters, for either a single car or double car garages, installing a garage door opener can restrict the clearance space/storage space near the ceiling as well. In the types of circumstances where homeowners may want to have a little more storage space in their garage yet still enjoy the conveniences of an automatic opener device, the ideal solution may be the installation of a wall mount garage door opener. A wall mounted model may also be called a jack shaft garage door opener. It is primarily installed on the wall immediately to the left or right of the garage door, provided there is a nearby power/electrical outlet inside the garage. This wall unit is merely attached to the garage door’s torsion bar, eliminating the rails that are customarily used to connect ceiling mounted openers to garage doors and thereby creating more overhead clearance. Due to its uniquely different installation and operation from a conventional chain, belt, or screw driven garage door openers, it is highly recommended that homeowners utilize the installation services of a professional supplier and installer like Markham Garage Doors to correctly mount their jackshaft garage door opener. The most common and reliable jackshaft style device is the LiftMaster Elite Series 8500 wall mount garage door opener. The sleek design of this unit takes minimal space itself upon installation while offering all of the space-saving flexibility and benefits noted above – along with reliable performance and ultra-quiet operation as well. To ensure proper functionality and adherence to warranty applications, the LiftMaster Elite Series 8500 wall mount garage door opener should be installed by a trained garage door service technician. Markham Garage Doors is a licensed dealer for the LiftMaster brand of garage door openers, and their technicians can, therefore, be trusted to install any and all LiftMaster models efficiently and reliably. A wall mount garage door opener may be the ideal solution to maximizing the available space in your garage. Call Markham Garage Doors today at (905) 472-9178 or (416) 570-3667 to arrange a no-obligation consultation to discuss the suitability of the LiftMaster 8500 to your specific needs. When a new garage door opener is first installed, homeowners might have the realistic expectation that the device will operate flawlessly, day after day, for many years. And in all probability, a garage door opener should perform for approximately 10 to 15 years, based on an average of 1,000 to 1,500 open-and-close cycles per year. But how many people actually keep track of the number of times that their garage door is opened and closed in a day, let alone over 10 to 15 years? Furthermore, what is the percentage of homeowners who can easily recall the year that the opener was installed? In the majority of cases, it is likely that homeowners simply expect their garage door to open or close every time they pull into the driveway and use the remote. So, when the day arrives that the garage door opener does not respond, they often stare at the remote in a state of disbelief. Batteries in the remote – weak or fully spent? Battery voltage – sufficient to power the opener? Battery contacts – corroded, discolored, wet/damp? Infrared eyes on remote and opener – scratched, broken, dirty? Frequency setting for the remote – aligned with the unit’s receiver? As noted previously, a garage door opener can have a life expectancy in the range of 10 to 15 years depending on the quality of the unit and its frequency of use. However, this does not mean that hiccups, like the situations described above, will not occur over that time period. If such issues cannot be found and resolved as a result of homeowner troubleshooting, a trained technician from Markham Garage Doors may be required to provide professional diagnostic and repair/replacement services. When a garage door opener stops working, it may seem too simplistic to suggest that the cause may be due to batteries in the remote or a blown fuse – but the solution is often something just that basic. The Markham Garage Doors technicians service all garage door opener models with the expertise needed to quickly and accurately identify/assess the issue and recommend the appropriate course of action. If a replacement opener is deemed to be the optimal solution, we carry the leading garage door openers from top manufacturers and provides prompt and affordable installation service. If you are experiencing an issue with your garage door opener and are unsure of the source of the problem, call the expert technicians from Markham Garage Doors today at (905) 472-9178 or (416) 570-3667 to book a complimentary consultation as soon as possible. In some ways, an automatic garage door opener can be likened to a cellphone, central air conditioning, or a television remote control. People may not appreciate the levels of comfort and convenience offered by such amenities until the day comes when they push the appropriate button and, lo and behold, nothing happens. It would almost seem like the device arbitrarily, and without warning, can just decide when it shall work no longer. However, when a garage door opener is working properly, it may come as a surprise to learn that the device itself does not actually lift or open the door. The lifting force is provided by the spring that is attached to the door, most often a torsion spring, which is designed and used to counterbalance the weight of the door via a significant amount of tension. When the garage door opener is activated, either through a wall switch or by remote control, its primary role is for regulating the speed and distance that the door travels/moves to fully open or close. Furthermore, a garage door opener can keep a door securely closed in lieu of a lock-and-key method. In all likelihood, and with proper care and maintenance, a garage door opener should perform for roughly 10 to 15 years, based on an estimated 1,000 to 1,500 opening-and-closing cycles annually. Eventually, fundamental wear-and-tear can cause the device to break down and cease to function in a proper and expected manner. If your garage door opener is making unusual or non-customary sounds, regardless of its age, this may be a sign that the device is struggling or straining and/or there may be an issue with the door itself (perhaps balance or spring tension). In such cases, it will be important to stop using it immediately and place a service call to a professional garage door opener repair service such as Markham Garage Doors. If your garage door opener is not functioning properly, call the experts at Markham Garage Doors today at (905) 472-9178 or (416) 570-3667 to determine if there is an issue with your garage door or whether a new opener will need to be installed.